RICHMOND, Va. -- Ed Gillespie, one of the Republican establishment's most respected advisers and powerful fundraisers, badly trails in the race for campaign cash and has asked television stations to stop running his ads for Senate with just three weeks left before Election Day. Reports filed with the Federal Communications Commission show Gillespie's campaign cancelling or drastically reducing the amount of money it plans to spend on television ads in coming days. At the same time, political operatives who track television advertising said Thursday that Gillespie does not have ads reserved in the final push toward the Nov. 4 elections. The financial struggles of Gillespie's campaign are something of a surprise. He was the Republican National Committee chairman, served in President George W. Bush's administration as a top adviser and was a top lieutenant to 2012 GOP presidential nominee Mitt Romney. That pedigree, however, has not translated to extraordinary fundraising. And that has left Gillespie at a distinct disadvantage when it comes to advertising. Following a report by The Associated Press about the drop-off in advertising, the Gillespie campaign said Thursday it would launch new rounds of TV ads on Saturday - but it did not specify when or where the ads would run, or at what cost. The campaign also announced it had banked $2 million for the final push to Election Day. That's about a quarter of what his Democratic rival, first-term Sen. Mark Warner, has on hand. Warner's campaign on Wednesday announced it had more than $8 million to spend in the race's final days. Warner is currently blanketing the state with TV. Gillispie has struggled to keep pace in fundraising and advertising. He loaned his campaign $65,000 over the summer. The non-partisan Center for Public Integrity shows Warner has spent $4.4 million on ads and the liberal Virginia Progress PAC has spent another $2 million. Gillispie has spent $3.5 million on ads, but a scant $174,000 has come from outside groups. In an interview Wednesday, Gillespie instead insisted his campaign will have enough cash to finish the race but declined to comment on specific plans. "We've got the resources to get our message out," Gillespie said. "We're implementing our ad strategy as we intended." Even so, buying television time to reach voters in population-heavy northern Virginia requires spending in the Washington, D.C., media market, where ads can cost more than $1 million each week. Airtime always becomes more expensive as Election Day nears and more candidates are clamoring for more spots. Last-minute efforts to buy ads put the campaigns at the mercy of station owners who can demand premium prices that put cash-strapped campaigns at a disadvantage. Should Gillespie lose, he would be positioned to run for governor in 2017. Virginia bans governors from seeking back-to-back terms, meaning he would not be challenging an incumbent. Gillespie has repeatedly said he's not considering running for governor and is focused on his current race. 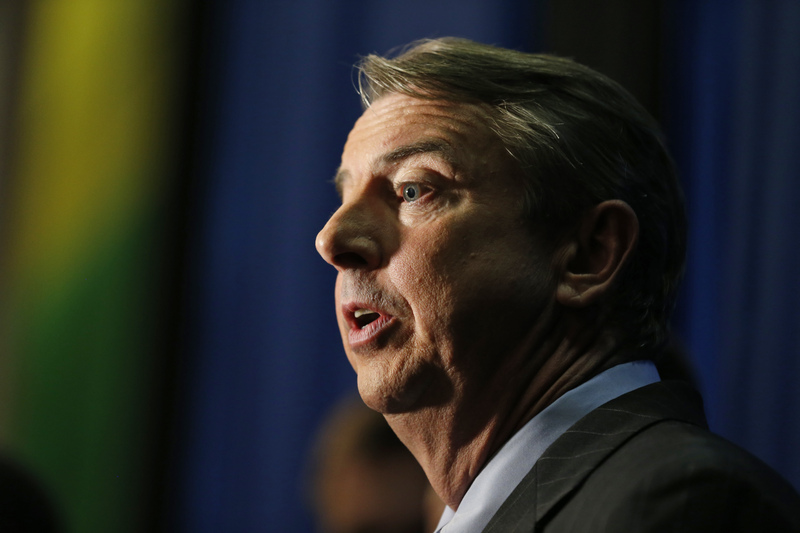 Republicans have struggled in statewide contests in politically divided Virginia in recent years. Last year, unsuccessful gubernatorial candidate Ken Cuccinelli was heavily outspent by Democrats in the final weeks of his campaign. If Gillespie were to run for governor, he would not be limited by federal campaign contribution limits. Races for statewide office in Virginia lack those limits, and Gillespie could essentially operate his campaign as a super PAC. Before joining the race, Gillespie was an informal adviser to one of the Republicans' most effective super PACs, American Crossroads.